I remember growing up and having to endure family get-togethers: holidays, birthdays, town festivals, baptisms…you name it. At dinner, the wine would be broken out and poured, and the one thing I remember is my Grandma always asking for someone to ‘pour me another half glass of my Chenin Blanc.’ I remember sneaking a sip of her favorite libation…and making faces of horror. Maybe it was because it was some cheap bulk wine of the varietal. Maybe it was because it had been sitting for close to an hour, warming up while the room filled with Grandma’s ‘hot air’ as she told her stories. All I ever knew about Chenin Blanc is it was Grandma’s sour drink and I wanted no part of it. Boy how times have changed!!! Chenin Blanc is definitely NOT your Grandma’s sour white wine! Chenin Blanc is a BEAUTIFUL grape varietal that is one of the most versatile of all of the white wine grapes. It can be done bone dry or as the most delicious of sweet dessert wines. It can be made as a semi-dry still wine or as a lovely sparkling wine. It can be sipped as a delicate aperitif, enjoyed with foods of all sorts (in fact, I think this varietal makes some of the most food friendly wines ever), or savored as a tantalizing dessert all unto itself. For those of you who have limited your white wine experience to over oaked Chardonnays, Sauvignon Blancs, and Pinot Grigio, you might want to go a little retro and break into Chenin Blanc. You’ll find some of the best Chenin Blanc in it’s native home: Loire Valley of France. Vouvray and Anjou make some of the most elegant wines that can be stored for several years. Then there are the South African Chenin Blancs, with more of the grape planted here than anywhere else in the world. These Chenin Blancs are a little more approachable earlier on. California also grows Chenin Blanc, but the one I’m THOROUGHLY enjoying tonight is the 2011 Hestia Cellars Chenin Blanc. This lovely 100% Chenin Blanc comes out of Columbia Valley in Washington. It spent 5 months in stainless steel tanks, so you don’t get all of that crazy oakiness that you’d get in so many different Chardonnays…this is just crisp, acidic goodness! It smells like honeydew melon, peaches, with just a slight ‘mineral’ scent. On the tongue, it’s got a medium mouthfeel and has those wonderful flavors of honeydew melon mixed with lemon and grapefruit. It is crisp, dry, and refreshing. Pair it up with grilled veggies, seafood, or do what I did and serve it up with a chicken vegetable stew with buckwheat dumplings. It cuts right through and is so PERFECT! Seriously, this wine is MADE for food!!! What else makes this wine to die for? The price: you can get it for around $16. It’s your new favorite dance partner for food…all under $20. Chill it up, drink it up, and toast your Grandma for having the good sense to know an awesome grape…even when she didn’t know how awesome it truly was and is. 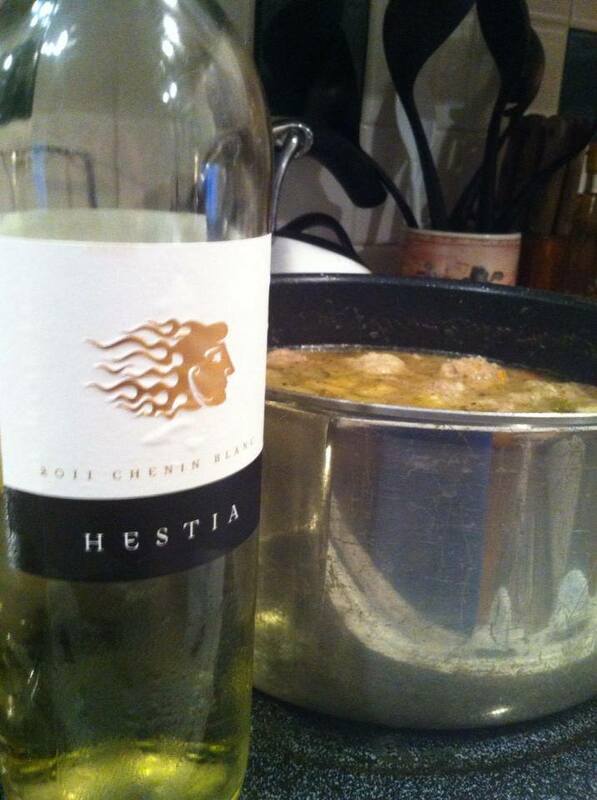 Here’s to you, Gram…and here’s to the 2011 Hestia Cellars Chenin Blanc. Get some in your glass tonight.